CO2 reduction in aqueous solutions is an attractive strategy for carbon capture and utilization. Cuprous oxide (Cu2O) is a promising catalyst for CO2 reduction as it can not only convert CO2 into valuable hydrocarbons but also suppress the side H2 evolution reaction (HER). However, the nature of the active sites is still under debate due to the complex surface structure of Cu2O under reducing conditions, leading to limited guidance in designing improved Cu2O catalysts. 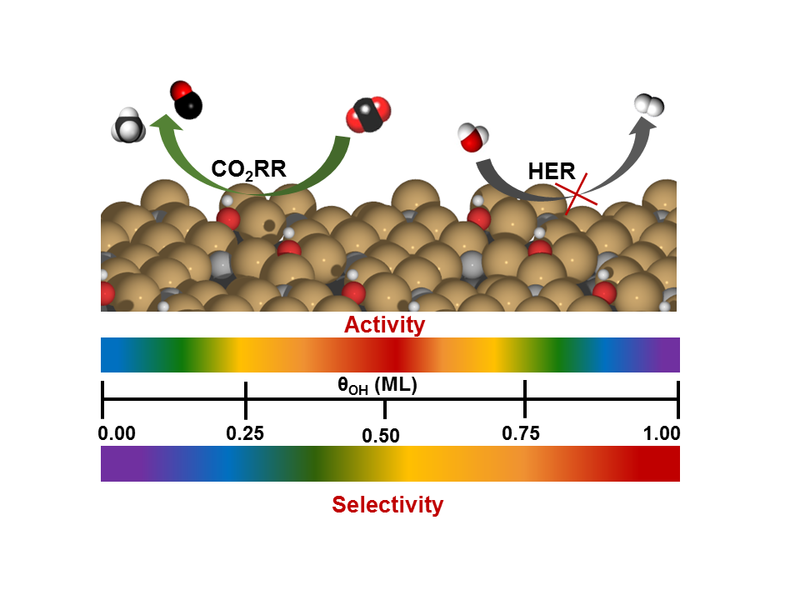 Our recent study identified the functionality of surface bounded hydroxyls on over partially reduced Cu2O(111) for CO2 reduction reaction (CO2RR) by combined density functional theory (DFT) calculations and experimental studies.